What’s it for? A cane can improve your balance as you walk or help you compensate for an injury or disability. What kind of cane should you choose? If you need the cane only for balance, consider a standard cane with a single tip. If you need the cane to bear weight, you might choose an offset cane with four tips. Check Tips and Treads: Choose canes with a rubber tip at the end. Make sure the rubber tips and treads on your cane, crutch and/ or walker wheels are not dry, cracked or worn down. Winter Safety: In winter, affix an "ice pick" on the end of your cane so it doesn’t skid on icy sidewalks. Choose an ice pick with four or five prongs for optimal ice grip. An ice pick-fitted cane is an extra support while navigating winter sidewalks. Keep it Dry! When coming back indoors with your cane or walker, always wipe the wheels or rubber tips dry. Sizing Your Cane: Use a walking aid that is actually measured for your height. These instructions will assist you in creating a comfortable fit with your cane or walker. 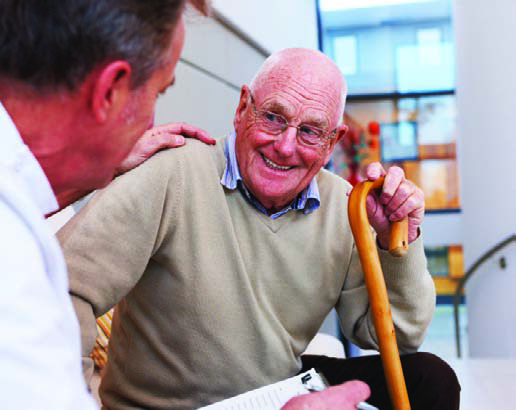 You can also ask your health care professional or physical therapist for assistance. Get a friend or family member to help you measure yourself so they can make sure you are standing correctly. Wear your regular shoes, and take measurements on a hard surface, like a wood or ceramic floor (not carpet). Stand upright in a relaxed stance. Choose the hand you will use to hold your cane. Normally it is the opposite hand from your injured side but in some cases it is the same hand. Talk to your healthcare provider or physiotherapist to determine the right side to use. Your arm should hang loosely at your side, and you should have a natural bend to your elbow when you’re standing. If measured correctly, the final bend to your elbow when walking with your cane will be approximately. 15 – 20 degrees. Your arms shouldn’t be straight, but also not overly bent. How to measure a cane. With your elbow at the natural 15 – 20 degree bend, measure from the floor to the centre of the wrist/watchband. Keep Your Cane Handy at Night: Keeping a cane or walker by your bedside can help you walk at night even though you may not use one during the day. Walk in Style! Who says you have to choose a traditional cane? Nowadays there is a wider and more fashionable selection of canes to choose from than ever before. Think of your cane as an accessory and find one that fits your personality. What’s it for? Reaching aids can help when you have trouble reaching high or bending low for tasks around the house. Many have suction cups or magnets on the end for extra grip. It will allow you to pick up even the smallest light items from the floor and higher cupboards. Note: Not for use with heavy items. If you must reach up to do high jobs, do it safely. Do not use a regular kitchen chair or any other furniture. Instead get a foldable step stool with a handrail, to keep in your kitchen or pantry for such purposes. What’s it for? Just as it sounds, a wheeled walker is a support device to try if you have trouble with walking short distances or balance. Rollator walkers have a seat you can use to sit and rest, and a basket for light items like your purse or the mail. Never use walkers to pull yourself up, as they may tip over. Instead, use the arms of a chair for extra support. Talk to your health care professional for more information about walkers and other mobility devices. What’s it for? If you have trouble putting on shoes and socks, aids like long-handled shoehorns, sock aids, elastic laces, velcro strips, and shoe removers can be helpful and save you from bending over and straining to perform these tasks. What’s it for? If you are having difficulties rising up from a chair, contact your local home healthcare vendor for information on devices such as chair risers, electric lift chairs and safety poles to assist you with these actions. Choose a firm higher chair with arms to make it easier to sit and stand.